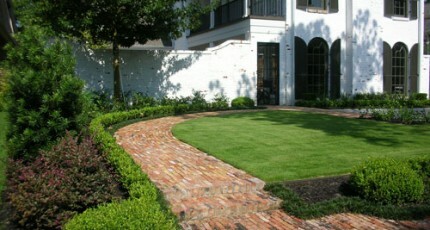 Hardscape constitutes 60%-80% of the existing landscape of any Houston yard. Masonry is an important part of any hardscape because it adds a vertical, multidimensional element to an otherwise horizontal plane. This is one of the most important elements of landscape architecture you can invest in if you are a Houston homeowner looking to create a superior outdoor living environment that also lends curb appeal and ultimate resale value to your property. The otherwise flat terrain of the Houston landscape becomes transformed into ascending and descending realities of ornamental stonework, custom patios, special stepping stone access points, and a myriad of specialty structures that provide unique living environments for plants above the surface of the ground. Many of the materials used in Houston masonry have been around for centuries. Stone and brick were the first masonry materials used in the most ancient of times. Today, the list of materials has been greatly expanded to include blocks, concrete cast materials, poured concrete, and textured concrete. People commonly ask us if they can do masonry work themselves. That depends on their level of skill and the amount of free time they are able to devote to the development of your own Houston landscape. Generally speaking, few professionals these days have this kind of time. You can count on much better results if you hire trained craftspeople to build these structures for you. The materials and forms that such a craftsman can create for you are beyond the scope of a single article. However, some of the more popular Houston masonry forms are discussed in the remainder of this piece, and should give you a good, clear picture on the many possibilities Exterior Worlds can create in your yard. Concrete is an increasingly popular material in Houston masonry. There is much more to concrete than people typically assume. 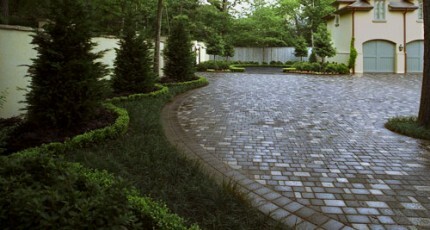 It is far more than a light gray slab of hardscape that looks like every other slab on the block. Concrete can be colored and finished to the extent that it almost looks like a polished form of stone. It can be constructed with borders and repeating patterns that reflect the motifs of home architecture. The concrete can then be polished in such a way as to compliment any number of landscape motifs, including modern, contemporary, and traditional. Polishing concrete is frequently done to attract attention in this way and offers so many decorative opportunities that by the time we are finished you will barely recognize it as concrete. Today’s sophisticated finishing methods allow us to achieve a level of aesthetic that can make concrete look indistinguishable from stones, but without the encumbrance of sealants or protection. Natural landscaping is very popular in parts of the city light the memorial area. The bayous that run near I-10 and the tall oak and pine trees that line them give landscape designers a world of opportunity to create all types of scenery reminiscent of mountain, forest, and river hideaways. Houston masonry contractors can create natural pools and streams using rounded river rocks set in mortar. Flat stones, small boulders, and gravel beds can be laid out in such a way as to mimic a wide range of geographies found throughout the Continental United States. Outdoor fireplaces and fire pits are rapidly gaining popularity throughout the Houston area. Bricks are the most popular materials that Houston masonry designers use to create these impressive outdoor gathering spots. Although brick is declining in popularity as a home building material, there are countless opportunities to landscape with brick. Add to that the simple fact that so many Houston homes are already built out of brick and you can see how an outdoor fireplace can add function and aesthetic to any type of landscape and any size yard in our city. Quarried stone has been the bedrock of masonry since ancient times. Quarried stones are no less important to today’s modern world of Houston masonry. They are very appropriate materials to use for complimenting the facades of contemporary and Mediterranean style homes. Also, they make excellent building materials for retaining walls and garden enclosures in landscapes surrounding these homes. Polished granite is favorite material that Houston masonry contractors use to build contemporary fountains. Not every garden is designed the way we stereotypically envision it as a grouping of plants and flowers in a section of the yard. Many gardens are planted above the linear plane of the yards surface in planters and terraces. This has been done for thousands of years in regions of the world where homes were build on hillsides and the building of terraces was necessary for soil retention, controlled irrigation, and proper drainage. Although the Houston landscape is markedly flat, terraces can still be artificially constructed by Houston masonry specialists who can construct any number of earthwork forms to support Italian and Mediterranean architectural and landscape themes. Concrete blocks can also be used to construct ascending rows of planters, each with a different shade of green and sprinkling of floral color. Many times this is done to create a sense of grand entryway to a special outdoor building like an arbor or a summer kitchen. A similar arrangement can be built in descending form to take guests gently down step by step to a shaded retreat of a poolside patio. Landscaping services by Exterior Worlds will save a homeowner enormous time and money by listening intently to the homeowner’s wishes and translating that wish list into a hardscape design that fits the scale and scope of the landscape master plan. We will then hire the appropriate masonry contractors, source the very best materials, and combine them with over two decades of expertise in landscape design and outdoor architecture construction.